Instagram has been nothing short of a revelation in its short lifespan. What started out as an app for iPhone now spans multiple devices and platforms, and having been purchased by Facebook last year for an eye-watering one billion dollars, its rise is quite rightly seen as landmark achievement. The app itself however, which allows users to take, edit, share and comment on photos, is certainly not as feature-rich as some would like, and the lack of ability to save photos – as one can on the Web – is certainly a limitation. It’s not the be-all, end-all of the Instagram experience, yet is still kind of annoying, but much like the new-found ability to copy text from the Facebook News Feed, a tweak for jailbroken iPhones has been developed to facilitate the saving of Instagram photos from your News Feed directly to the device’s camera roll. The tweak, named InstaSave, slots into the Instagram app as if it were always there – a sure sign of a polished tweak. 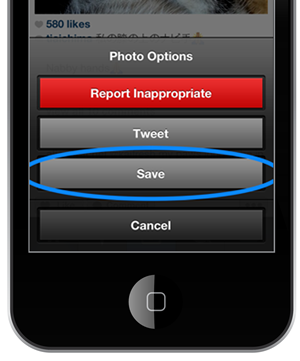 Once you install it, there are no configurable settings to mess around with, you simply tap that ellipsis button when you’ve stumbled across a photo you want to save from within the official Instagram app, and a new ‘Save’ button will join the usual fleet of options. Of course, you could just take a screenshot of the desired image, but you’re then left with a cropping job on your hands. This method / tweak saves the photo, the whole photo, and nothing but the photo. InstaSave is available to download for free over at the BigBoss repository, which should sit in your list of sources unless you’ve opted to remove it yourself. Once you have located it, install it, and you’re good to go. As mentioned before, you don’t need to meddle with any settings thereafter. So as long as you have the official version of Instagram installed (this will not work with any third-party offering), the button will appear after a respring. Download it, give it a whirl, and let us know if it runs smoothly for you by leaving your comments via the usual mediums below.